Canada's international trade minister said it's important to recognize the Islamic State doesn't represent Muslims and that it's important to stand up for diversity. TORONTO — Canada's trade minister found herself in a spirited debate over diversity on an American late night show. 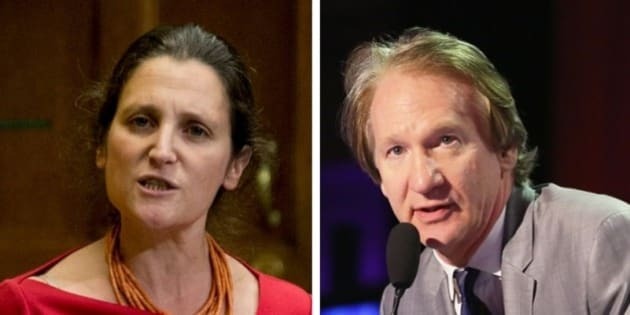 Chrystia Freeland was part of a panel on "Real Time" with Bill Maher that aired Friday night. Maher quoted a poll that suggested a majority of Americans don't feel that Syrian refugees share American values. Freeland challenged Maher when he went on to say that it's nonsense to suggest that all religions are alike and share values. She said in the wake of the terrorist attacks in Paris it's important to recognize the Islamic State doesn't represent Muslims and that it's important to stand up for diversity. Canada is poised to accept 25,000 Syrian refugees by the end of this year. The government is expected to announce on Tuesday the mechanics of bringing them into the country. Maher and Freeland clashed when the late night comic said there is a small percentage of Muslims who support ISIL and practices like honour killings and forced marriages. "I think now it is incredibly dangerous and very wrong to persecute Muslims and say there is something wrong with being a Muslim," Freeland said, who appeared on a panel with former Maine governor Angus King and Conservative blogger Ben Domenech. Maher denied he's demonizing Muslims, but said their ideas need to be changed. "You're saying their ideas are bad?" Freeland asked. "Killing women for being raped, I would say is a bad idea. I do. Hang me for it," Maher shot back. Freeland, a former media executive, has appeared in the past on Maher's show and has also appeared on a number of other American shows.